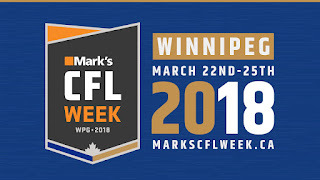 The biggest stars in the Canadian Football League (CFL) will be in attendance at Mark’s CFL Week in Winnipeg from March 21st -25th along with the league’s largest offseason party at Mark’s CFL Week Fan Fest at the RBC Convention Centre. 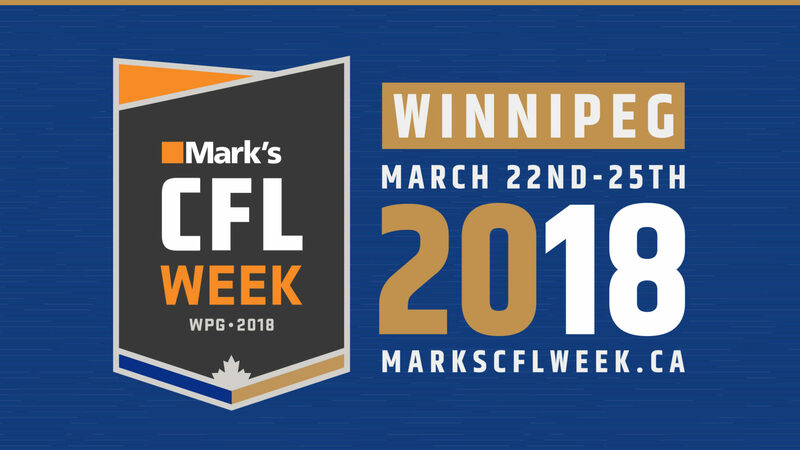 A total of 52 CFL stars will be making their way to Winnipeg in March to be part of Mark’s CFL Week. The League has unveiled details for Mark’s CFL Week Fan Fest: the CFL will take over more than 105,000 square feet of space at the RBC Convention Centre in Halls A, B and C. Additionally, to give the Fan Fest a true football feel, an 80-yard by 40-yard football field will be installed in the middle of the Convention Centre, where it will play host to 2018 CFL Draft prospects at the CFL Combine presented by adidas, as well as fan activities during Fan Fest. To register for tickets to events and for more information about Mark’s CFL Week, please visit www.Markscflweek.ca. Darvin Adams (WPG), Manny Arceneaux (BC), Brandon Banks (HAM), Adarius Bowman (WPG), John Bowman (MTL), Bryan Burnham (BC), Zach Collaros (SSK), DaVaris Daniels (CGY), Larry Dean (HAM), Weston Dressler (WPG), Solomon Elimimian (BC), Greg Ellingson (OTT), Roy Finch (CGY), James Franklin (TOR), Josh Freeman (MTL), C.J. Gable (EDM), Ed Gainey (SSK), S.J. Green (TOR), Aaron Grymes (EDM), Andrew Harris (WPG), Trevor Harris (OTT), Kyries Hebert (OTT), Charleston Hughes (SSK), Ernest Jackson (MTL), Willie Jefferson (SSK), Jonathon Jennings (BC), Kamar Jorden (CGY), Cleyon Laing (TOR), Ted Laurent (HAM), Simoni Lawrence (HAM), Maurice Leggett (WPG), Richard Leonard (HAM), Taylor Loffler (WPG), Jeremiah Masoli (HAM), Jerome Messam (SSK), Marken Michel (CGY), Matt Nichols (WPG), William Powell (OTT), Ricky Ray (TOR), Mike Reilly (EDM), Namaan Roosevelt (SSK), Almondo Sewell (EDM), Alex Singleton (CGY), Brad Sinopoli (OTT), Diontae Spencer (OTT), Tyrell Sutton (MTL), Luke Tasker (HAM), Derel Walker (EDM), Jamaal Westerman (MTL), James Wilder Jr. (TOR), Chris Williams (MTL), Odell Willis (BC) and Bear Woods (TOR). Football Frenzy Field: Fans will have the chance to put themselves through the same combine as the players on the turf where the CFL Combine top prospects will be competing on Saturday morning. Football Frenzy Field will play host to the Fan Combine where fans can test their skills and get the same stats as the players. Football Frenzy Field will also play host to two Mascot Mania shows, featuring all nine mascots from the CFL and a Bombers Cheer School. Get your Tickets: Register for free tickets to National Scouting Combine events including 40-yard dash (Saturday morning), Bench Press (Saturday night), as well as other events. To register for tickets, click here. Tickets have sold out for the Western Regional Scouting Combine presented by adidas and for the National CFL Scouting Combine events on Sunday, March 25 that include vertical and broad jump as well as individual drills and one-on-ones. Fans can also register for events like #MarksCFLWeek #TweetUp, ‘You Make the Call’ presented by PwC, Be a Ref, Passing Showcase, Riderville and Girls Flag Football Clinic. 2018 CFHOF class unveiled: This year’s inductees to the Canadian Football Hall of Fame will be announced at a special VIP Reception hosted by CFL on TSN’s Rod Smith on March 21 at the Pinnacle Club in Investors Group Field. Bomber legends Doug Brown, Paul Bennett, Matt Dunigan, Milt Stegall and Chris Walby will join fans to salute the brand-new class of ’18. To purchase tickets for the Canadian Football Hall of Fame VIP Reception, click here. Can I Get Your Autograph? : Fan Fest will feature six autograph signing sessions including 2017 Most Outstanding Player Mike Reilly and 2017 Most Outstanding Defensive Player Alex Singleton at the Autograph Stage. Others who are set to join the stage include CFL All-Stars Charleston Hughes and Willie Jefferson; Blue Bomber players Andrew Harris, Maurice Leggett and Adarius Bowman; Blue Bomber legends Milt Stegall, Matt Dunigan and Doug Brown; as well as the 2018 Canadian Football Hall of Fame class. Kids Zone: There will be plenty of options for families with kids. A zone will be dedicated for kids that will include activities like an inflatable obstacle course and quarterback toss. Young CFL fans can pretend to be their favourite player and enter through a tunnel just like a CFL star, as well as visit an eyeblack station to gear up. Twisted Tea Fan Cave Entertainment: This is where fans will want to flock for entertainment. The Twisted Tea Fan Cave will host the Mark’s CFL Week Live Show with Brodie Lawson and Davis Sanchez. It will also host ‘You Make The Call’ with Darren Hackwood presented by PwC, Blue Bombers Tailgate, Riderville at Mark’s CFL Week with DJ Leo, Ultimate Bombers Alumni Challenge, Tweet Up and more, including ‘Hide Your Crazy’ performing live on Saturday night. Mark’s Ultimate Fan: At the Mark’s activation, fans can play life-sized Guess Who with their friends. After the game, enter the Mark’s full-sized Photo Booth and pose for your photo on the cover of a magazine. Take a Photo with the Grey Cup: The Grey Cup will make an appearance at Mark’s CFL Week Fan Fest. Come see the holy grail for Canadian Football and take a photo with a piece of history. SportsCentre Desk: Ever wanted to see how it feels to sit behind the SportsCentre desk like Rod Smith or Milt Stegall? Fans will have their TV moment at the SportsCentre desk and can catch the team broadcasting right from the heart of Fan Fest. Warner Brothers Rampage Run: Think you’re ready for the big leagues but want to test the waters? Take part in ‘Rampage Run’! In Dwayne ‘The Rock’ Johnson’s newest movie, fans can star in a picture-perfect 20-yard dash and record their time. Athabasca University: Want to join your favourite team? You can Get Drafted with Randy Ambrosie and see your name on the back of a jersey! A life sized cut out of the Commissioner will pose for a photo with fans, with Randy Ambrosie coming by in person on Saturday just after noon. On Thursday night of Mark’s CFL Week join Athabasca University as they host a panel Moving Beyond: Athletes in the Community with Blue Bomber greats Milt Stegall and Matt Dunigan as well as ‘The Buds’ consisting of Brad Sinopoli and Greg Ellingson for a panel chat on community involvement and discussing how the relationships between players and their communities foster and grow today. Virtual Reality: Test your accuracy with hard-hitting stats inside the Kicking Simulator. Kick the football through a simulated field goal post and get accurate real-time information to see how you measure up. Play of the Week GIF Station: This is where fans will be able to create a highlight reel play (with a safe landing on a crash mat for huge jumps) and save it in a GIF or slow-motion format video. From diving catches to one-handed grabs, get it all on tape and show your friends!